"NEWS" Safe Levels of Manganese Fume Decreased by 10 Fold From an Already Low Level ! Some Provinces in Canada have already incorporated these new levels in their laws. OSHA, will follow as they have in the past ! JUST HOW LOW IS THE NEW MAXIMUM ALLOWABLE MANGANESE FUME LEVEL? 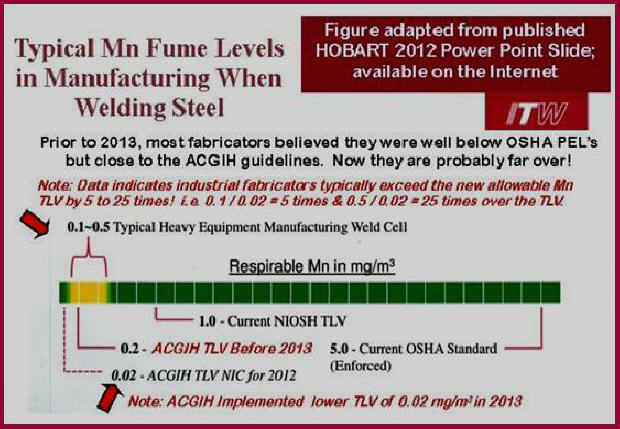 When our welding R&D Lab started to routinely measure welding filler metal fume levels, in the mid 1970's, the allowed "Threshold Limit Value," (TLV) for Manganese was 5 mg/m3. That was the same as iron so it was not considered a significant issue. The TLV has reduced steadily over the years and now is at the very low level of 0.02 mg/m3. 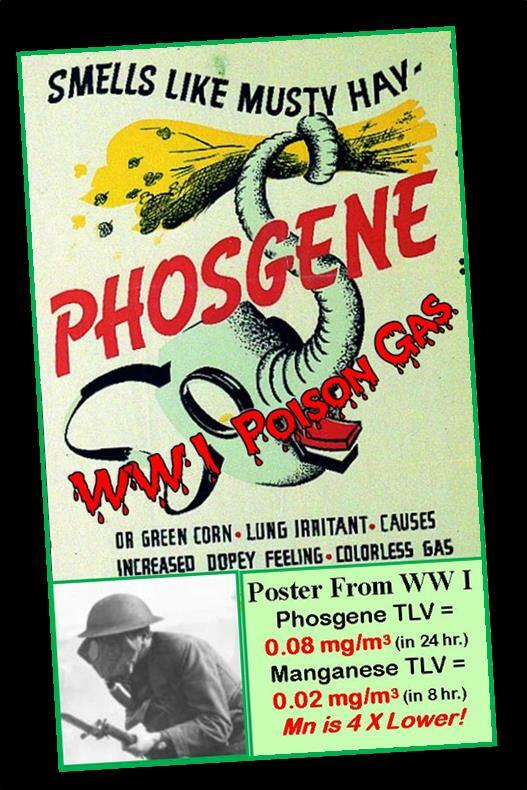 Compare with the TLV for a poison gas used in WW I, Phosgene, it is 4 times lower! That level of exposure is determined as an average acceptable over an 8 hour work day. You or the management of the company must measure to see if this rate is being exceeded. These are not short time measurements. 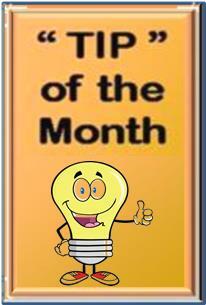 A welder wears a small battery powered pump on their belt that pulls air into a filter for usually 4 or more hours. The flow rate is about the same as human breathing rate. The inlet to the filter is usually a small plastic hose with the open end attached under the welding helmet. Fumes entering the tubing will be collected by the filter. The total fume weight is then accurately measured and the chemical composition analyzed. If you don't have the resources to have these measurements made then follow the welding filler metals manufacturers warnings on the box. Most, if not all, say "If you don't measure, wear a respirator." If you're only welding for a short time during the day you may not be exceeding the allowable maximum level but measuring is the only way to be sure. Details: In 2013, the maximum allowable levels of exposure to Manganese was reduced to a very low amount. Manganese is a common alloy element in all steel. Cases sited for this recent change include: A study that demonstrated increased neurobehavioral changes among workers exposed to 0.01 to 0.04 mg.m3. Another statistical model showed a level of 0.02 mg/.m3 would lead to impaired hand steadiness in 2.5 % of the workers. From the information in the above, when welding in an industrial environment, Manganese fumes could easily exceed the new lower allowable Manganese level by 5 to over 10 times! Only actual measurement can define if this is the case. If it is, and more ventilation is not possible, some type of respirator may be needed. Manufacturers of welding electrodes warn on their MSDS's and filler metal package warnings: Use a respirator or air supplied respirator when welding in a confined space, or where local exhaust or ventilation is not sufficient to keep exposure values within safe limits. 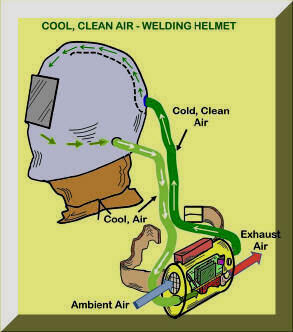 See a Possible Solution Below - Our Recently Patented Welding Helmet Design. Welders on TV often use HAZARDOUS Practices for the purposes of a better visual production. The program credits may have Warning Statements to the effect that simulations were made for TV viewing and normal safeguards were not used etc. The following information is provided to assist in understanding proper WELDING SAFETY. In addition to this AWS document, read all of the safety information from the manufacturer of the equipment and filler materials you are using such as Operating Manual, Warning Labels and Materials Safety Data Sheets. PROTECT YOURSELF AND OTHERS. READ AND UNDERSTAND THIS INFORMATION. 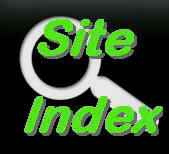 If you have questions ask your supplier or write / email the products manufacturer for answers. FUMES AND GASES CAN BE HAZARDOUS TO YOUR HEALTH. USE ENOUGH VENTILATION, EXHAUST AT THE ARC, OR BOTH, TO KEEP FUMES AND GASES FROM YOUR BREATHING ZONE AND THE GENERAL AREA. The fumes (smoke) coming from the welding arc contain potentially hazardous chemical compounds. Be sure to keep your head out of the fume plum. Although obvious, since the smoke is visible and doesn’t smell or taste good, be sure to position your head so the fumes are moving away from your welding helmet. 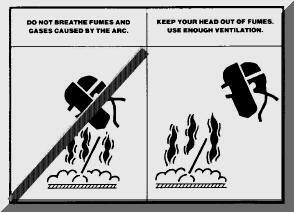 in our fume measurement work in our filler metals and welding gases Laboratory, in the 1970's, we developed the pictogram on the right that some use to reinforce this important precaution that a welder can practice. Much less obvious, is exposure to very low level allowable chemicals such Manganese (as mentioned above) as well as Chrome an Nickel, particularly when welding stainless steel. Actual exposure levels must be measured over a normal work day. Much more information on ventilation and when welding special materials is available in the Z49.1 publication such as not welding on cadmium plated parts (those pretty gold colored parts often used in older automotive bolts, etc.) or on painted or solvent cleaned surfaces. This is an area often see violated on TV. The Ultraviolet Light coming from the arc is like looking at the Sun. DON’T DO IT! Often some folks are seen turning their head away from directly looking at the arc; however the Arc Rays are getting to the side of their eye which will still cause eye injury. TV folks may be seen welding with short sleeves, open shirts or no gloves. That may look “cool” for TV but Arc Rays can burn unprotected skin. Similar serious problems can occur as overexposure to the sun . COVER UP! MIG welding wire on a spool is electrically “”hot” and is exposed on some welding machines. The MIG torch tip and other torch parts are also electrically “hot,” as are TIG torch parts and Stick holders. Depending on the specific welding machine being used, the voltage can be quite high. TIG and Stick welders often have voltages of 70 and above and can deliver much more current than required to cause electrocution! WEAR CORRECT EYE, EAR, AND BODY PROTECTION. If you need glasses to correct vision be sure to use them or a magnifying lens for your welding helmet. This helps make you see clearly while your head is held away from the arc zone avoiding the fume plum. Also, use safety glasses with side shields and see that those around you are also wearing them. You only have two eyes, DON’T RISK THEM. Be sure to wear clothing that prevents sparks from hitting your skin. Note, about 1/3 of the lost time accidents attributed to eye injuries are caused by rubbing! Even if you wear eye protection, when your cleaning up remember metal shavings may be ground into fingers, collected in eyebrows or are resting on the skin as you inadvertently rub your eyes or wipe perspiration from your face! Determine what combustible materials are present in the work location. Relocate them 35 feet from the welding area where possible. If not possible then use a fire resistant welding blanket to protect them from welding spatter etc. A fire extinguisher should be readily available and after welding watch for enough time to be sure any possible material that may have been exposed to welding sparks is not smoldering. BEFORE USING A WELDER, READ AND UNDERSTAND THE MANUFACTURERS INSTRUCTIONS AND ASK FOR THE THEIR MATERIAL SAFETY DATA SHEETS (MSDS) FOR THEIR WELDING MATERIALS. Companies that distribute welding materials can give you the MSDS having specific information related to the possible harmful products that may evolve from the welding wire or welding flux you are using. Just ask. 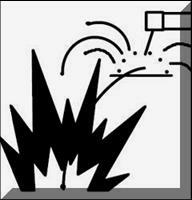 Manufacturers of the materials can also supply you with he appropriate MSDS. These are free for the asking, take advantage of the information. IF WELDING WHILE AT WORK, ASK FOR YOUR EMPLOYERS SAFETY PRACTICES. You leave a MIG welder in the repair pit while you go to lunch. The pit is 5 feet deep, 4 feet wide and 8 feet long with an air volume of 160 CF. FACT: there is 21% Oxygen in Normal Air. At less than 18% Oxygen you can become dizzy and unconscious without warning signs. The 160 CF pit normally has160 CF X 21% or 34 CF of Oxygen. You bend down to thread in a new spool of wire and are probably exposed to even a lower concentration than 17% Oxygen in the shielding gas rich atmosphere at the pit bottom! No one knows you're there; you pass out and die!! In March 2007 three workers died in Quebec. The situation is similar to our hypothetical example so we'll provide details. Two welders had worked in a tank and left for the day leaving the tank open. They died the next day when they returned since there was argon leaking in the tank over night. Even though the tank was left open, only 10 per cent oxygen was found to be in the tank. A first responder also died trying to help the two welders! In March 2005, Robert Wilson died while welding a super duplex stainless tank in Moray, Scotland. In April 1994, a welder died while welding pipe in Alaska. In March 1989, a welder died while welding in a titanium tank in British Columbia. In April 1981 a welder, Jose Duncan, died in a shipyard in Mississippi. Other deaths have occurred which may not be documented on the Internet such as one in a Virginia shipyard in the 1980's. While not involved in a welding incident, in May 2008 three workers unloading a ship died of Argon Asphyxiation in Fort Lauderdale FL. One passed out in a confined area and two others trying to help their fellow worker went in after him. A liquid Argon container was found to be the culprit. Remember liquid Argon containers vent to maintain the liquid temperatures as pressure builds in the container. They must be stored where there is adequate ventilation. Even Argon Cylinders can leak, especially in the valve area. Always store these containers where there is adequate ventilation an carefully follow other storage rules. Consult your gas supplier. ANSI Z49.1 publication has information and references on this subject. As noted above, this publication is available as a free download from the American Welding Society. Carbon Dioxide is even heavier than Argon; 52% heavier than air versus Argon which is 38% heavier. Therefore it will sink to a low level before mixing by mechanical means or diffusion. At 1%; can cause drowsiness with prolonged exposure. At 2%; causes increased blood pressure and a 50% increase in pulse rate. At 4 to 5% breathing increases about 4 fold, dizziness, confusion and difficulty in breathing accompanied by headache and shortness of breath occur. At 8 to 10% it causes headache, sweating, dim vision, tremor and loss of consciousness after exposure for between five and ten minutes. Over 10% unconsciousness occurs more rapidly and leads to asphyxiation and death. Always check all shielding gas lines and fittings for leaks. Shut the gas supply off at the cylinder whenever you stop welding. Be sure all areas where welding is occurring have adequate ventilation. Be especially vigilant in confined areas. Always have a friend watching when you enter and work a confined area. Follow all safety regulations of an employer. Read ANSI Z49.1 "Safety in Welding and Cutting and Allied Processes" for further information. Ask your welding gas supplier for gases safety information. Also remember there may be other potentially hazardous elements in the welding fume that may exceed allowable safe levels if you are welding in an area without adequate ventilation. "Phosgene is formed by decomposition of chlorinated hydrocarbon solvents by ultraviolet radiation (like the arc radiation we get when weldin.) It reacts with moisture in the lungs to produce hydrogen chloride, which in turn destroys lung tissue. For this reason, any use of chlorinated solvents should be well away from welding operations or any operation in which ultraviolet radiation or intense heat is generated." DON'T WELD ON PARTS WITH CHLORINATED HYDROCARBON SOLVENT RESIDUAL OR WELD NEAR WHERE THEY ARE BEING USED! Wearing a quality respirator to filter welding fumes, especially under a welding helmet, is uncomfortable (these are not simple dust masks but more like that used when painting a car.) In addition, a respirator just adds to the heat that may already be objectionable when welding. Our patented helmet design, granted by the US Patent and Trademark Office on December 25, 2012 (US 8,336,113) not only filters the air to an acceptable level, it cools the air using a thermoelectric cooling module. By cooling the head, research shows that sweat on the arms and other parts of the body reduces. Thermoelectric devices are used in solid-state refrigerators, for cooling electronics etc. In fact, some NASCAR drivers use a similar device to avoid excess heat! Our patent defines an innovative method to reduce the electrical power requirements by 50% or more. This helmet can increase a welders desire to wear it, by improving their general environment! Excessive heat is a common complaint of welders. This helmet helps solve the excess heat problem by providing cooled, clean, breathable air. 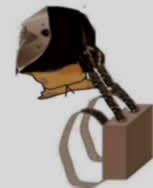 Note patent covers a number of configurations including typical welding PAPR construction and possible use of a backpack arrangement. We are searching for a company to license these designs, including large fabricators employing a number of welders who would benefit from the reduced heat and better environment. Contact Jerry_Uttrachi@NetWelding.com if interested. 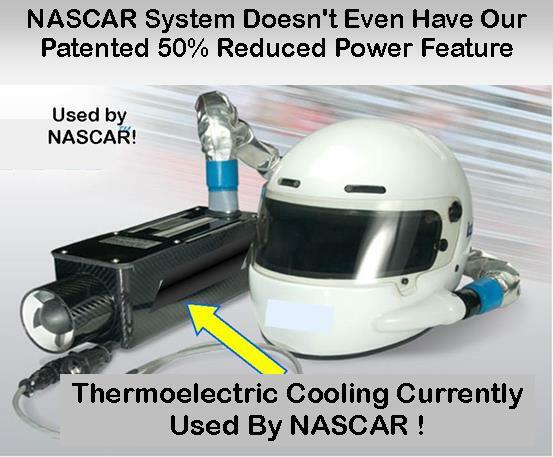 Of interest, some NASCAR teams are currently using a thermoelectric device to cool hot drivers! Their light weight compact device does not even use our patented idea that reduces power requirements by 50% or more.